I turned the stamp upside down and stamped the leaf using Hero Arts Ombre ink. Papertrey Ink's Turning a New Leaf has to be one of my all time favourite stamps. This is so simple and pretty. 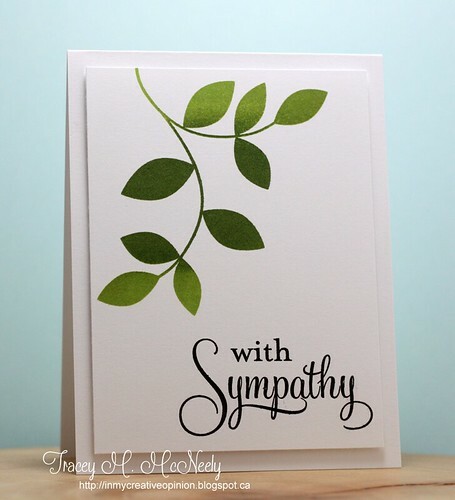 Perfect sympathy card. Clean, crisp and beautiful, Tracey. Love the ombre ink on the leaves. Another total winner Tracey - you amaze me... the vine is GORGEOUS - I love the ombre effect and the beautiful script sentiment. Not missing a single thing - can't believe this is a one layer card - amazing! Feels like a magic trick LOL! One of my all time favorite stamps, too! Beautiful ombre effect with your inks, and your sentiment is just perfect! Stunning CAS card, Tracey! 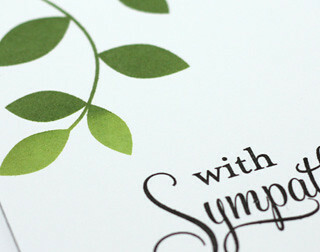 This is a fabulous sympathy card. I prefer them to be simple and with a bit of greenery. So beautiful. I love that set too. Stunning! Please tell me who makes the sympathy stamp? It is beautiful! So beautifully clean and simple, Tracey. All of the above, and more! Really just perfect, Tracey! I really love that stamp set from PTI too! I sometimes forget I have it...thanks for the inspiration! Beautiful card! Just beautiful, Tracey!!! I used Turning a New Leaf this week! The card won't post till next week, but I've been super loving this set again. 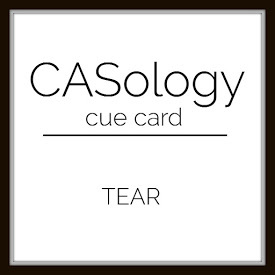 I wonder how many people will read tear as (cries) and how many will read tear as (torn paper) for the challenge? I can see why you love this stamp set. The leaf image is stunning - especially in the ombre ink. Beautiful card. Just beautiful Tracey...love the clean look and your leaves are gorgeous! You are a genius Tracey, tear shaped leaves. This card is CAS perfection. Such gorgeous simplicity & love those ombre leaves! Your card is peaceful and lovely, Tracey. I'm sorry to contact you this way, but I can't seem to get my computer to e-mail you (new laptop, new Windows 10...) My name was chosen as the winner for 12 Kits. my email is banorton@mainedotrrdotcom Would you mind e-mailing me? Thanks Tracey! This is fabulous!! I have this stamp set and now I have to CASE this!!! Lovely design! !